SHE DIDN’T WANT her face splayed on photographs or her real name printed in bold on pages of unknown, unimaginably far-away newspapers. But Halwo* wanted people to know. To know that lives of the other are here, present and stingingly overlooked. When she talks about her children, about Amiin, her eyes get watery and there’s no stopping the tears. 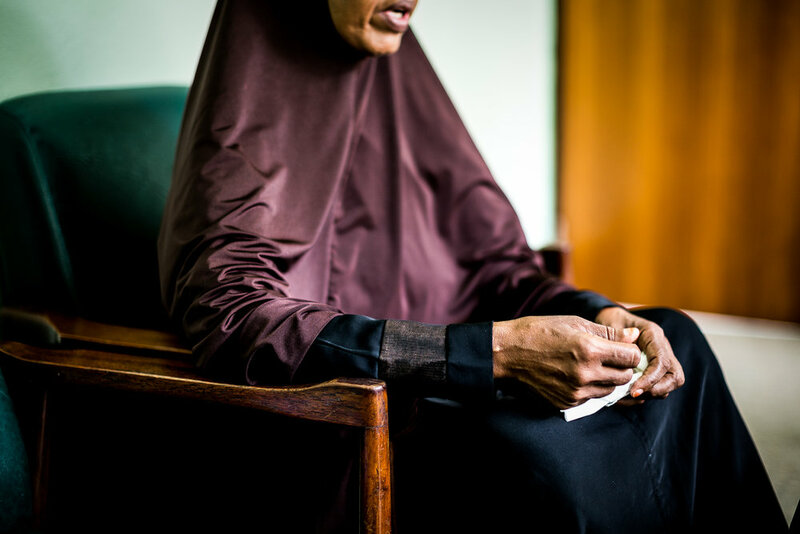 Halwo, a Somali woman unsure if widowed already or merely not yet, not sure of her children’s destinies—both future and past. Sitting in a nondescript office just a stone’s throw away from rivers of traffic flowing through the veins of this Asian megalopolis, amid a landscape of concrete and skywalks suspended mid-air as foreign to her as anything she could’ve ever imagined while herding goats on the arid plains of her homeland, with carefully worded patience she tells me of those days leading to her escape. Now, at 37, she is re-learning to navigate her life from scratch in a town as disorienting as they get, challenging even to the ones born in its chaotic womb. Talking to her, I instinctively understand that her life, were she born in a country that had given her the opportunity, her smarts would’ve carried her far. It’s because of her eyes, a dark shade of green, that I understand this: they are constantly glinting with flashes of comprehension even though we speak different languages, even in spite of us sharing precious few cultural notions. As much as she wished for it, life in Somalia is rarely lived in isolation. Her husband, skilled at turning the patch of dirt behind their house into a garden resplendent with rice, fruits and millet—and doing so one rainy season after another, was the ire of his neighbors who watched him enviously from their adjacent dusty field. It wasn’t long before the burly man living next door paid a visit and accused the family of putting a curse on his crops. Superstitions are no laughing matter in rural Somalia, much less so when used politically. Halwo and her husband were born into a small Somali clan called Arainale and, in the village, they were its only members. The majority of the villagers were of the Hawiye clan and, her neighbor, sensing a power dynamic giving him an upper hand, seized the opportunity. The next day, Halwo’s song she was singing while washing dishes and trying to get the dusty house in order, was interrupted by a gunshot. Fighting her legs paralyzed with fear, she trudged out of the house and ran to the kilometer-distant farm. Amiin was lying among the old dry leaves of last-year’s corn, his mouth open and crackling with choking sounds, his head jarringly open where his temple was supposed to be. He died right there, at only 13 years of age, in Halwo’s arms. His and her pain must have been agonizing. She tried but was not able to drag his limp body to the house, she was nauseated by fear for her other two sons. She ran back into the house and she found her youngest one, Mustafa, sitting in the corner. She grabbed his hand and ran out of the front door looking for her other son, for her husband. She circled the whole village, screaming for help. No door was opened, no voice was heard, her cries unanswered. In frenzy, she ran back home only to see that the gate was wide open and there were noises coming out of the house. Treading lightly, peeking through the window, she saw the neighbor holding her husband by the collar of his dress. She flinched, hid under the windowsill and, as if involuntarily, fled the scene. That was the last time she has ever seen her husband. Or her two missing boys. There was no time to think things through. Halwo did not have any money on her and knew of one person only who might be able to help: her friend, Abyan, with whom she used to play the game of girir when she was young. She let her win on many occasions—allowing her to throw the little stones higher into the air than hers—and now Halwo hoped that her kindness would be repaid with a hiding place and temporary peace of mind. Last she heard, Abyan lived in a bigger town, almost a hundred kilometers on foot. After sleeping in the field for a night, she took Mustafa by hand and they set off towards the town. At a nearby train station, Halwo noticed a Somali man buying food from a street vendor. “I spoke no word of this language, I knew no one and nothing about this world and my only chance was to ask this man for help hoping he will not do worse things to me and my son than we have already gone through.” The man proved to be a blessing, providing Halwo with shelter and taking her to organizations that help refugees in urban areas.